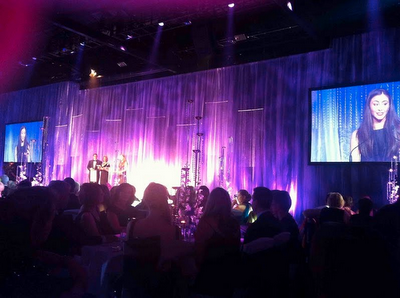 Annually Telstra hosts the business woman of the year awards. It's a reasonably big deal to be nominated, let alone make it any further in the process. This year, our Jodie Fox was a finalist for three of the five categories at a state level for her work with Shoes of Prey (Marie Claire Young Business Woman, Nokia Innovation and Hudson Private and Corporate). The Hudson Private and Corporate award is entered by women who own up to 50% of their own company, or whom are not business owners, but are nominated by the businesses that they work for. A big category! And against very stiff competition Jodie took out this prestigious award both in NSW and nationally. Sit at the table: don't underestimate yourself or attribute your success to others. This is difficult for women particularly because studies show that success is negatively correlated to likeability for women, where it is the inverse for men. Make your partner a real partner. Don't leave before you leave: stay focussed and driven until it is time for you to take timeout if you have to - for example, to have children. They seem like pretty simple messages but we're so steeped in the way things are that these simple ideas are the most powerful tools for change. I'd strongly encourage you to watch the Ted talk as it really draws the points out so well. We're really proud of Jodie for winning this award and as a mostly female tech start-up, we're proud to be part of helping to make a better future for business women. Congratulations, Jodie! I loved that TED Talk, too: It really resonated and seemed excellent life/career advice. Fantastic news - congratulations Jodie! Thanks for the link to the talk too.. was very inspiring and particularly relevant. Has also inspired me to blog about it! I have encountered a few people who were inspired by Jodie Fox during a convention that I attended about starting designer eboutiques and fashion ecommerce websites. Listening to how they were encouraged by Jodie Fox and similar women achievers was truly inspiring that I began to search more about them and the award giving body that recognizes such exemplary achievement. Amazing. Welcome to the team Ritwik and Chung! Good luck Ken and welcome to the team Dave!